In this latest installment of the blockbuster series, time is running out as war between the Olympians and the evil Titan lord Kronos draws near. Even the safe haven of Camp Half-Blood grows more vulnerable by the minute as Kronos's army prepares to invade its once impenetrable borders. To stop them, Percy and his demigod friends must set out on a quest through the Labyrinth-a sprawling underground world with stunning surprises at every turn. Rick Riordan has done it again. Each Book seems to get better and better and I don’t even know how. Each book lives up to the expectations that the Percy Jackson series holds. I never got bored reading The Battle of the Labyrinth. There was always something that got me interested and pulled me in. I never wanted to put the book down when a book makes me feel like this, I loved it. The signature humour of Rick Riordan still is very much present in this book but I also feel that The Battle of the Labyrinth had this serious tone to it. I think it’s because Percy and the rest of the character are becoming older and that the prophecy is impending. I also think it could a metaphor in such sense of Greek Mythology stories in the terms of tragedy and consequence. As well the characters are maturing and changing realistically from year to year so The Battle of the Labyrinth is also richer in romance and the dark elements increase as the characters age up. Again it’s an action packed, cliff hanging book that you don’t want to put down. I love action and the action in The Battle of the Labyrinth is pretty awesome. Practically from the first few pages we have action. You have no idea when danger is near and you want to scream at those characters that go straight into the danger. And then you have those moments when the ends of chapters leave you on the edge of your seat wanting more. I love Greek Mythology and one of my favourite myths is Thesues and the Minotaur. So having a whole book based on the setting of the Labyrinth is pretty epic. In the book we get more in depth of some of the well-known Greek Characters, like Daedalus, the father of Icarus. I think that Rick’s take on Daedalus about his life after the fall was very original and intriguing. There is trouble again forming in Camp Half Blood. There is another way to get into camp and that's through the Labyrinth (I don’t think this is too much of a spoiler as it is said in the title that they are going into a Labyrinth) So the Gang set off to try and find a way to stop this from happening. There is trouble again forming in Camp Half Blood. There is another way to get into camp and that through the Labyrinth (I don’t think this is too much of a spoiler as it is said in the title that they are going into a Labyrinth) So the Gang go down to try and find a way to stop this from happening. As I read the journey through the Labyrinth I was captivated and so into the story as the Labyrinth is believed to be one of the only architecture that constantly changes. So you don’t know what was going to happen next, what tunnels would change, new tunnels pop up, traps are in the most unexpected places and monsters could be anywhere. I love how we get to see new and old characters. Percy is growing and maturing. He is finding more about himself and others. Annabeth is finding it hard to let go of her past and how much Luke really means to her. We also get to see Tyson again and I just love him alot. The way that Rick writes him, makes me put a smile onto my face. I also believe that in all the Percy Jackson books the young characters are always faced with difficult decisions that affect more than just their individual lives. You can change your actions but the impact of your choices can sometimes be everlasting. This is shown alot through The Battle of the Labyrinth and I think that is something that everyone can get out of reading the books. So I Give Percy Jackson: The Battle of the Labyrinth 5 stars out of 5. 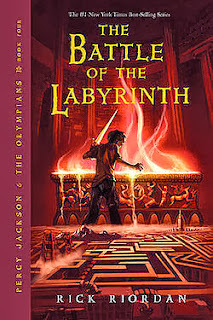 Have you read The Battle of the Labyrinth? What did you think of it? If you haven’t do you want to read it?